Two of the world’s best chefs—Noma’s René Redzepi and Coi’s Daniel Patterson—improvise in a home kitchen as they explore the way inspiration turns raw ingredients into a finished dish. Chefs René Redzepi and Daniel Patterson were prowling the fields of County Line Harvest, a Bay Area farm in the Marin County hills. The two were assessing the greens and root vegetables growing in the rich dirt, in anticipation of a weekend spent cooking together at Patterson’s house in Oakland, California. Their goal was to explore the question, How does inspiration turn into a recipe? René Redzepi, a radical naturalist, searches for ingredients at farms and parks. Photo © Michael Turek. Soon, Redzepi was pulling up a Tokyo turnip from the ground. As he examined it, he regaled Patterson with tales of turnips in Kyoto, Japan, that, he said, “Eat like ripe pears—crazy juicy. There’s no bitterness; they taste intensely and deeply of turnip.” Patterson was a few yards away, extolling the sweetness and “complete wraparound broccoli flavor” of the leaves of young broccoli shoots. “They’re so much better than just the florets,” he said. Acres of northern California produce can overwhelm even two of the world’s best chefs. Redzepi proposed a restriction: that they work only with vegetables from within two square meters of County Line Harvest. Patterson agreed, and from a postage-stamp-size plot, he and Redzepi began filling tote bags with shelling peas, pea shoots, infant broccoli, broccoli rabe flowers and a weed called sour grass, or sorrel. Restriction—“a smaller sandbox to play in,” as Redzepi puts it—has helped make the Danish chef one of the most acclaimed culinary talents in the universe. He opened his Copenhagen restaurant Noma at the age of 26 in 2003, a time when few people took Nordic cuisine seriously. Disavowing black pepper, olive oil and other non-local staples, Redzepi began looking more closely at what grew around him. His focus turned into a sort of radical naturalism that led him to discover, categorize and develop a cuisine around the edibles he found in the wilderness—new varieties of horseradish or seaweed, for instance, or a beach grass with a flavor identical to cilantro. One of the signature dishes at Noma is white asparagus cooked with pine branches plucked from trees that grow alongside the asparagus field; it’s landscape as recipe, and the results are improbably compelling. Redzepi was not unfamiliar with the Bay Area; he had cooked at the French Laundry in Napa Valley for six months. But he’d never had much time to explore. And he’d never had a tour guide like Patterson, who knows the area as intimately as Redzepi knows Copenhagen, and in much the same way. The owner of a growing empire anchored by San Francisco’s exceptional Coi restaurant and an F&W Best New Chef 1997, Patterson had bonded with Redzepi at the intense, international, chefs-only food conference Cook It Raw. 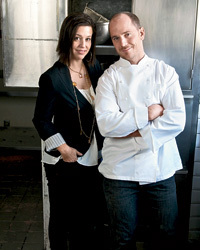 Together, the two wanted to investigate the process of inventing new dishes from start to finish. Cooking in a home kitchen, away from the pressures of their restaurants or a chef-packed event, they wanted to try to better understand their own creative processes. After County Line Harvest, a trip to the Ferry Plaza Farmers Market in San Francisco yielded enough citrus, vegetables and nuts to fill a dump truck. Redzepi noted that Copenhagen was enduring its bitterest season in memory, leaving his cooks scrambling for cabbage, then joked to Patterson, “You call this winter?” René Redzepi and Daniel Patterson brainstorm a new dish. Photo © Michael Turek. Back at Patterson’s house, after a brief brainstorming session, the two chefs got busy in the kitchen—washing vegetables, separating leaves from stalks, discussing the potential of rutabaga or the wisdom of juicing turnips. “Here, try this,” was the refrain as the two fed each other trimmings and odd ends, noting new possibilities in an herb or a weed’s particular stage of maturity or ripeness, and how that affected the subtlety of its flavor. They joked about how they’d traded the professional equipment of their restaurant kitchens for an electric range with a broken burner; left behind things like Pacojets and gelling agents. “I just whisk lemon juice in olive oil at home,” said Redzepi, perhaps stretching the truth. The pair stayed up late, sketching out ideas for the next day on Patterson’s three-year-old son’s notepads. Early the next morning, Patterson was on barista duty, squeezing out espresso shots and drizzling milk patterns on cappuccinos. Then he turned his attention to eggs. He demonstrated his “poach-scramble” technique for Redzepi: Drop a well-beaten egg into a quart of boiling water in a small saucepan, cook covered for 20 seconds, then dump the contents into a strainer set over the sink. The result is a supercreamy, ideally scrambled egg, made almost instantly and without any fat. Redzepi had another plan for eggs but was so impressed with Patterson’s technique that he used the same method. He gamely counted off the 20 seconds in Macedonian, his father’s native language. Patterson topped his egg with a sauce of fresh chèvre and water, adding a garnish of rosemary flowers he’d gathered from the roadside while walking his dog earlier that morning. Redzepi finished his with a sauce of aged goat cheese and nasturtium blossoms; he’d spotted the wildflowers in Patterson’s backyard while drinking coffee on the porch. “Same eggs, two sauces,” confirmed Patterson. “But the rosemary flowers I used actually go better with René’s sauce,” which was more nutty and buttery. “Rosemary has that kind of savory, floral sweetness, a little bit of pine resin,” he continued. “More depth. I think the nasturtium”—a decidedly peppery flower—“goes great with the fresh cheese sauce I made.” René Redzepi and Daniel Patterson will taste continually until they’re happy with a dish. Photo © Michael Turek. Redzepi tasted both dishes. “Absolutely,” he said. “Maybe we should just put them together.” And so they turned out bowls of amalgamated cheese-sauced eggs for Patterson’s family’s breakfast. They surveyed the scene—which, to the untrained eye, looked like an unusually unkempt urban park. Patterson stopped at a wild bush dotted with small dark berries and identified them as “pyracantha, or colloquially, firethorn berries.” He said he’d learned about them from his wife’s mother and that making a jam from them was “an old California thing.” He and Redzepi had talked about making cranberry sauce for bison the night before; they rejiggered their thinking to accommodate their new find. Down on the waterfront, Redzepi started pulling up fistfuls of wood sorrel, a fine, small, soft green herb with a milky sourness. For him, spotting it is Foraging 101, since it grows “just about everywhere” in the Northern hemisphere. “Look in practically any woods, or even most parks, and you’ll find it.” For both chefs, fresh flowers, herbs and weeds (like sorrel) add color and aromatic, fresh notes to a dish—“I want my food to taste alive,” Redzepi said. He added, “We know a hundred ways to cook a veal chop and almost nothing about how to eat what grows wild near where we live.” Still, Redzepi is leery of becoming a poster boy for foraging, because it is only one resource for his creativity. 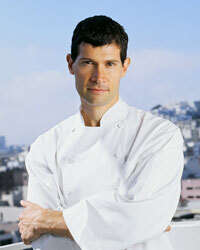 The entire natural world is what inspires him and helps him forge his own style of cooking. On the drive back, Redzepi talked through an idea for a dish: He’d cut a variety of citrus into sections, dot each one with a different herb or flower and sauce the plate with a quick reduction of chicken stock and brown butter. “That sounds like the pickle-and-meat-sauce dish I ate at Noma,” said Patterson. Redzepi nodded. “That’s the underlying message,” Patterson said. “Look around you and use what’s there. It’s not about re-creating what we’re doing in this one tiny little place. Everywhere you go, you’ll find something different. Don’t use pickles just because René does at Noma.” René Redzepi and Daniel Patterson in the kitchen. Photo © Michael Turek. Constantly tasting the food, expounding philosophically and making continual, gentle fun of each other (it emerged that Redzepi has the ability to blow his bangs back from his forehead like an ’80s sitcom star) are just a few of the reasons why it got dark outside without a proper dinner for Patterson’s family. In two days, the chefs had created almost 20 dishes. The remains of many of their cooking experiments lay around the kitchen—a simple sauté of potatoes, artichokes and mushrooms topped with goat cheese shavings, a fresh oyster “dip” with potato chips—but the words “chicken” and “pasta” were the only ones that Patterson’s family kept floating out. And so the great chefs René Redzepi and Daniel Patterson collaborated on a family meal, serving whole-wheat pasta (all that was in the pantry) with chicken breasts (all that was left after Redzepi made his sauce for the citrus) and the leftover cheese sauces from that morning’s eggs. To prettify the plate, Redzepi foraged some fennel fronds (from the refrigerator) to scatter over a huge platter of leftover vegetables he’d sautéed with soy sauce and ginger. Everybody sat down to dinner, amused by the contrast of the ambitious culinary agenda of the weekend and the modest meal that was set on the table at the end of it, and proceeded to hungrily eat it all. Peter Meehan, a New York City–based writer, is co-editor with chef David Chang of the food magazine Lucky Peach. René Redzepi and Daniel Patterson create a new dish. Photo © Michael Turek. Chef Daniel Patterson stands at his espresso machine at home, staring at coffee beans while making a cappuccino. “We should cook something with coffee,” he says to chef René Redzepi. 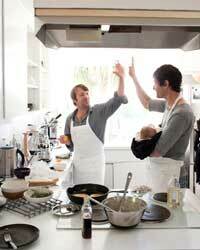 Redzepi happens to be holding a winter squash. “Why don’t we bury this squash in coffee and see if it takes on the flavor of the beans?” he responds. Patterson and Redzepi roast the sweet squash with the bitter, nutty beans, and the combination of flavors is surprisingly good. Patterson adds crème fraîche as a garnish. The chefs discuss making the dish with carrots, which have a similar flavor to winter squash but are easier to prepare. Patterson takes the idea back to his restaurant. As a replacement for the traditional cheese course, he now offers crème fraîche with a garnish of coffee-roasted carrots. Do Recipes Make You a Better Cook?